My mother's story begins in Berlin, Germany in 1937. Hitler had been in power for 4 years. The impact and intention of the Third Reich had only just begun to make itself clear . She - Rosel, her two older sisters - Ruth and Eva, her mother - Lotte, her father Josef Klein, and maternal grandmother/Oma - Frieda Silberstein lived at 4 Rosenthaler Strasse, one of Berlin's longest and most historic streets. Their lives then were much like ours are today. Her oldest sister - Ruth - attended public school. Her father - Josef - was a shoemaker with his own thriving and successful shoe-making shop. Her mother - Lotte - was a homemaker, raising and caring for their ever-growing family. Although aware of the threat of increasing restrictive religious regulations, their father chose to stay. Their day-to-day lives were remembered as ordinary, free and in their own way - 'normal'. November 1938 - their normal lives came to an abrupt end with 'Kristalnacht'. Josef's business was vandalized and destroyed. All Jews were mandated to wear yellow stars. Jewish children were forbidden from attending local schools. December 1938 - the Klein family packed themselves up and fled to Brussels, Belgium where there was extended family (maternal Aunt Paula and Uncle Julius Kantorowicz) to welcome them. Although life was precious and precarious, they managed to procure housing and to live there in relative peace for 10 months. Ruth - the eldest - attended public school at Place D'Annessns. Lotte found herself pregnant. 10 May 1940 - Germany invaded Belgium. 11 May 1940 - with the exception of their grandmother/Oma, once and again the Klein family found themselves on the run. They packed themselves up and fled. This time they headed towards the south of France. Their hope was to outrun the Germans. Because all the trains had been bombed, they were forced to flee on foot. Josef managed to find a large cart to carry their pregnant and ailing mother, Rosel and Eva. With Ruth holding tight to her father's hand (and along with hundreds of others) they walked their way to Lille, only to arrive and find that the Germans had beaten them to it. They'd invaded and taken over. In Lille - they managed only to survive. They found a small apartment in which to live. Their mother was pregnant and sick. Their father found work. The girls spent their days in a Carmelite Convent. There - they were safe. June 1940 - their mother died in their home of tuberculosis. Hopeless and desperate, and without anyone to care for his three girls - their father returned to Brussels to the apartment in which their Grandmother/Oma still resided. There - they were placed in L'Home des Enfants Assistes, where they looked forward to their father's regular weekly visits. Sometime in the fall of 1942, those visits abruptly ended. Although the girls had no knowledge or understanding of it at the time, we now know that 12 December 1942, their father - Josef - was arrested and one month later (15 January 1943) deported to Auschwitz on Transport XIX, #119. Without further financial assistance from their father, and with a new law that forbade Jewish children from living in non-Jewish orphanages or attending public schools, the girls were relocated to another orphanage. This time - a Jewish one - where they remained from April thru August 1943. As fear grew and news of the 'final solution' spread, their Aunt Paula and Uncle Julius who had managed to thus far evade the Nazis, decided to rescue the girls from the orphanage. Within a few short days of their return to their aunt and uncle's home, they were rounded up and taken to the basement of the Gestapo headquarters - a dark cave like place where many were tortured and killed. After one long night in those chambers, they were placed on a truck that took them all to Malines, Belgium - a designated interim camp from which its inhabitants were deported to Auschwitz. They spent 6 weeks in Malines while awaiting their assigned transport #XXIIA under the numbers 203 (Ruth), 204 (Eva), 205 (Rosel). 16 September 1943 - for reasons unknown to them - all three girls were liberated from Malines. While others boarded their assigned transports, they were left at the gate. Since then - we've learned. In an effort to look 'good' and to 'save face' with the world, the Nazis created a rule stating that children under the age of 15 and without parents, would not be immediately deported. Instead - they were taken to Wesembeek, Belgium. Controlled by the Germans, it was meant only as a temporary measure and stop. Ultimately - they too - were to be rounded up as a part of the Final Solution. 20 September 1943 - their Aunt Paula and Uncle Julius were deported on that same transport #XXIIA, numbers 200 and 201 respectively. Neither of them survived. For the next 6 months, the girls remained there at Wesembeek under the Germans watch. March 1944 - the deportation of those children held there began. Again - due to an almost-accident-of-fate and connections with the Jewish Defence Committee - instead of boarding transports, the girls were taken away to hide in a convent in Sugny, Belgium. They were forced to change their names from Klein to Kleen. Ruth took on the name Simone. Eva became Eve. And Rosel became Rose. They recall that the convent was a horrible and cruel place. Although the photos show them smiling, there was nothing happy about it. August 1944 - Sugny was liberated by the Americans. December 1944 - the three girls were returned to Wesembeek which was no longer controlled by the Germans, but what had become a holding place for those children who had no one and nothing else. They remained there for almost 2 years. 18 September 1946 - they were relocated to Auderghem in Brussels. They lived in an orthodox Jewish home for displaced and orphaned children run by Dr. & Mme. Rothschild. While there - they learned that their grandmother/Oma had quite miraculously survived, and still lived in her Brussels apartment. The girls had the opportunity to briefly re-unite before she died of old age. At Auderdegm - life carried on. Children laughed and played, celebrated holidays, and went to school. The war had ended. There was no longer any need to hide. They were orphans. Without families. Without homes. December 1947 - along with thousands of other orphaned children - they left their past lives behind, and boarded a boat that took them across the English channel to Southampton, England. There were very few stories that my mother shared with us as children. One was about how they used stones as pick-up jax and rolled up socks as bouncing balls. Another was of them being sent to bed before dark on Shabbat. Without anything other to play with, they self-entertained by bouncing those rolled up socks off the walls. Being on an upper bunk - my mother over-extended her reach in trying to catch the ball, fell off the bed and injured her wrist. It being Shabbat, and their being orthodox - they were reluctant to take her to the hospital to have it looked at and x-rayed. Eventually they must have acquiesced, as we've found medical records stating that on 14 June 1947 Rosel Klein spent one night in l'Hopitale St. Pierre due to a broken arm. 4 January 1948 - sponsored by the War Orphans Act and Canadian Jewish Congress - the three girls set sail aboard the Acquitania, taking them from England to Canada. Five long and seasick days later, they landed in Halifax, Nova Scotia. 12 January 1948 - they arrived in Toronto where the Jewish Immigrant Aid Society (JIAS) - helped the children find new homes. My mother - Rosel - was the first to be adopted by Moe and Mildred Levine. Her new Canadian name became Roselle. Moe became the only maternal grandfather I knew. Eva was taken in by the Wilsons. The last to go - Ruth - was taken in by the Goldens a few months later. While Ruth and Eva remained in Toronto, my mother moved to Phoenix, Arizona with Moe and Mildred and her new brother Harvey. Soon thereafter - Mildred died of a heart condition. In the summer of 1952 - they returned to Canada and to Montreal, where she became a part of another and new blended family. Her father, Moe, married Freda (my maternal grandmother), who had two children - Tom and Sue - of her own. Often - I've believed - one of the greatest tragedies was that of the sisters being separated and adopted by three separate families to live three separate lives, after having fought for so many years to stay together. 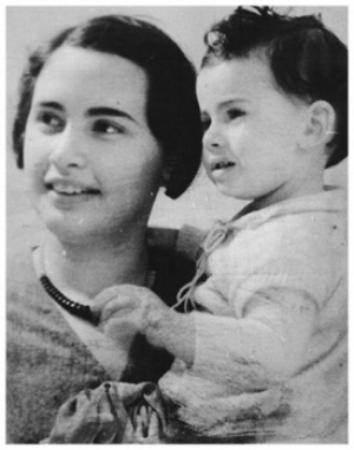 25 August 1957 - my mother married my father - Lorne Abramowitz. Together - they had three children, who made eight grandchildren, who are now making babies of their own. Ruth had three children, who made six grandchildren. Eva had two children, who made four. My mother never wished to be identified as a survivor. It wasn't until well into our adult lives that we began to understand the truth of her childhood past. Most of the details didn't become clear until she and her eldest sister - Ruth - returned to Belgium in 2012. Her last wish was to have her parents names included and engraved on her tombstone. It was important to her that they had a marked place to rest. In no small part it was due to the kindness of strangers that these three girls quite accidentally survived. We are sad for all that was lost...and grateful for all that we have.